North Korean leader Kim Jong-un has visited the mausoleum of his late father in Pyongyang to commemorate the 7th anniversary of his death, the country's state media said Monday. Kim paid his respects at the Kumsusan Palace of the Sun "on the occasion of the greatest national memorial day," according to the Korean Central News Agency. "He paid highest tribute to Kim Jong-il who devoted his all to the prosperity of the country and the happiness of the people until the last moments of his revolutionary career," the KCNA said. He called for stepped-up efforts to "fulfill the obligation and duties as his revolutionary soldiers" and work hard to "implement his plan and desire to the last without an inch of deflection and any concession." 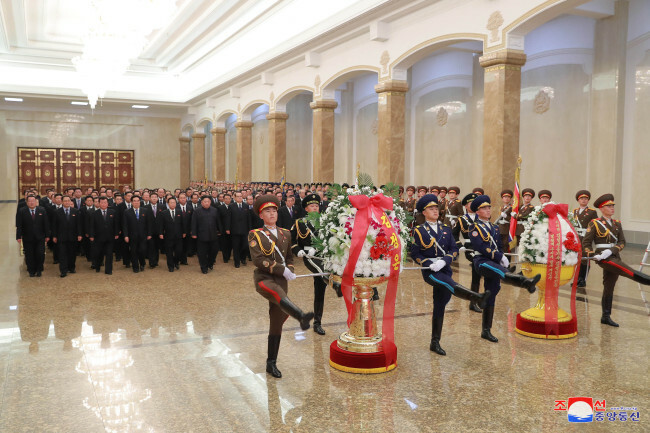 Kim was accompanied by senior party officials, the KCNA said, though it did not specify who joined his visit to the mausoleum where the bodies of the leader's father and the country's founder, Kim Il-sung, are enshrined. A photo that appeared on the front page of the Rodong Sinmun, the newspaper of the North's ruling party, showed senior party officials, such as Pak Tae-song, O Su-yong, Kim Pyong-hae, Choe Ryong-hae and Ri Su-yong, marching together with leader Kim. The newspaper extensively covered related events that took place across the North to commemorate the seventh anniversary. It was his first public activity reported by the country's media in two weeks. His latest reported outing was a trip to a shoe-making factory in Wonsan on the North's east coast earlier this month. The visit came as denuclearization talks between North Korea and the United States have been almost stalled since their historic June summit in Singapore. Pyongyang wants sanctions relief in return for what it sees as the substantive denuclearization steps it has taken since the summit. Washington is asking for more tangible measures before making such major concessions. US President Donald Trump said earlier this month that he expects to have a second summit with Kim in January or February.